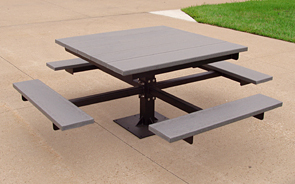 Capturing the charm of traditional picnic tables this recycled plastic picnic table supported by a sturdy powder-coated steel frame would make an excellent choice for any outdoor eating area. Made with nine 2" x 10" recycled plastic slats available in the standard Resinwood colors of green, cedar, and gray. The frame is powder-coated black. ADA Universal Access model is available.